Ballinacourty, An Rinn, Kilrossanty and Rathgormack have qualified for the quarter finals. Back Row (L to R): P. Langan Snr., S. Leahy, P. O'Connor, P. McGovern (background), G. Foley, A. Flynn, T. Waters (hat), M. Landers, P. Daly (background), T. Kiely, D. O'Connor (background), M. O'Connor, L. Whelan. Front Row (L to R): P. Langan Jnr., D. Whelan, M. McHugh, S. O'Brien (Capt. ), N. McGovern, J. O'Connor, P. Dillon, M. Fives. 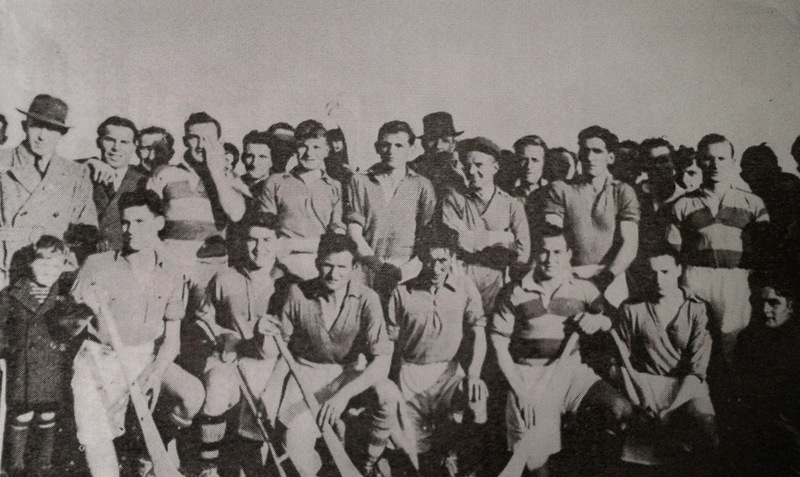 This week's photo brings us back to 1950 and the Abbeyside team that won the County Junior Hurling title following a 2-4 to 1-3 victory over Dunhill at Fraher Field. This win allowed the Village to participate in the Senior Hurling Championship for the first time since its foundation in 1927. Our popular Jack the Joker Fundraiser will continue this Sunday night in Minnies Bar where the Jackpot will be €7,254 as on Sunday night Eleanor McCarthy was drawn out of the drum and picked card 30 which wasn’t the Joker though she did win €50. Liam Enright and Liam Waters won €25 each. As well as our group of ticket sellers tickets can be purchased from Convenience Store Ballinroad, The Village Inn, Village Flowers, Spar, Mike Kiely’s Butchers and Mousies Takeaway. Last Saturday evening we played Roanmore in Round 5 of the County Championship in Kill where a good performance in the second half saw us emerge as winners. We now play Mt. Sion in the quarter final of the championship. TEAM: S. ENRIGHT, G. BREEN, S. O’HARE, B. LOOBY, M. POWER, R. FOLEY, J. O’MAHONY, S. O’DONOVAN, M. O’HALLORAN, D. COLLINS, J. HURNEY, G. HURNEY, T. MURRAY, M. FERNCOMBE, P. HURENY. SUBS: M. FIVES, M. GORMAN, C. PRUNTY. On Friday evening last we played Kilgobnet in Colligan in the Western Championship and after a very entertaining hour’s hurling it was our opponents who took the spoils. Despite this defeat we still qualify for the knock out stages of the championship where our opponents are Shamrocks. We would like to thank Mary Fahy of Kilgobnet for the assistance she gave to one of our injured players during Friday night’s game. TEAM: J.P. McGRATH, P. BREEN, D. BYRNE, D. FERNCOMBE, P. COLLINS, D. MORRISSEY, D. HICKEY, M. MAHER, R. CONWAY, E. YOUNG, S. LANNIGAN, S. FLYNN, D. SWEENEY, I. KIELY, R. PROCTOR. SUBS: R. COSGRAVE, A. MOLONEY, J. WALSH. This Saturday evening we play Kilrossanty in Round 5 of the County Championship in Fraher Field at 7pm. We play Dungarvan in the Western Semi Final this Thursday night in Fraher Field at 7:30pm. We would ask those cyclists with sponsorship cards not yet returned to please return them to the organisers of the cycle as soon as possible. This Sunday our Club Bingo returns to the CBS Hall at 8:30 pm where the jackpot is €1,250. Any member who wishes to put their name in the draw for All Ireland Hurling Final Tickets is asked to contact the Club Secretary by this Sunday night. Our under 14 hurling team played their last league game in the county championship on Monday night last week away to Ballygunner. Despite starting slowly our lads finished well and won on a score line of 5-9 to 1-10 in the end. Our next match here is the quarter final stage and this will take place on the 13th September. Our next under 13 outing is the county final against the eastern champions on September 6th in Fraher Field. We played our fourth round of the minor hurling championship last Wednesday against Sacred Heart at the Burgery. This match also doubled up as the Kieran Lennon Tournament and it was great to see a good turnout on the night to support the team and to show their appreciation to the Lennon family. We played well here and in the end came away with victory. After the game the Kieran Lennon Cup was presented to our captain Jack Duggan by Theresa Lennon and many of those present availed of the refreshments provided by the hard working group of ladies headed up by Niamh Enright. We were due to play our local rivals the Brickey Rangers in the latest round of the under 16 hurling championship on Monday night last. At the time of going to print the result of this match was unavailable but will be included in next week’s notes. Our underage outdoor hurling continues this Saturday morning the 30th August at the Burgery at 10.30 am. All are welcome. This covers all age ranges from under 5 to under 10. Anyone who has not paid their membership yet is asked to pay it on the morning for insurance reasons. Membership forms will also be given out on the morning. Helmets are compulsory and if required can be purchased at a reduced price of €50. There will be a €2 cost also to cover expenses. Click here to see pictures of Abbeyside's County Senior Hurling Championship victory over Roanmore played at Kill on Saturday night last. Again, many thanks to Seán Byrne Photography for providing us with these photos. The first four teams have qualified for the quarter finals. The league position of teams on equal points was determined by the result between both teams. De La Salle, Abbeyside, Passage and Lismore have qualified for the quarter finals. Back Row (L to R): Séamus Sheilds, Richard Morrissey, Paudie Morrissey, Denis Byrne, Peter Phelan, Cian Moloney, Denis Byrne, John Cosgrave, Joey Mullen. Middle Row (L to R): Pakie Hurney, Eoin Enright, Paul O'Brien, Tomás Kiely, Ciarán Shields, Neil Murray, Michael Murray, Ronan Fleming, Noel Fleming, Greg Fives. Front Row (L to R): Michael Cosgrave, Patrick Hurney, Eddie Casey, Stephen Power, Thomas Cashin (Capt. ), Brian Scanlon, Michael Browne, Seán Cleary, Richie Cosgrave. This week's photo shows the Abbeyside Junior 'B' Hurling Panel that won the Western Championship in 2003, thereby retaining the title captured the previous year. 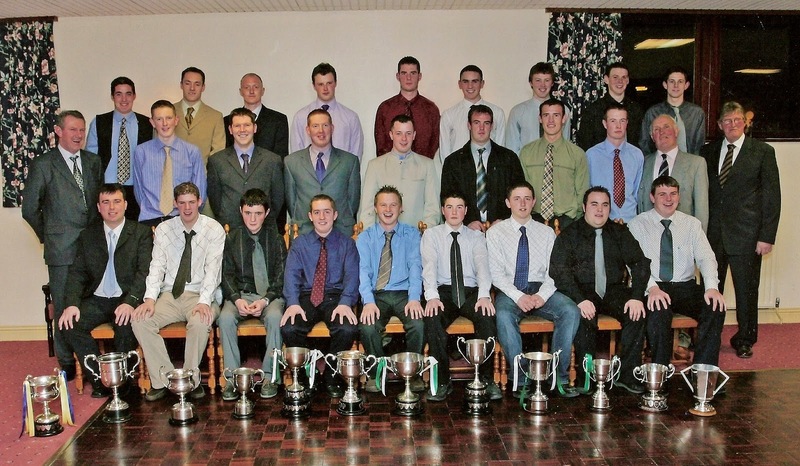 The picture was taken at the club social in early 2004 held at Clonea Hotel. Our popular Jack the Joker Fundraiser will continue this Sunday night in Minnies Bar where the Jackpot will be €7,068 as on Sunday night Orla Forde was drawn out of the drum and picked card 42 which wasn’t the Joker though she did win €50. Peggy Walsh and Stephen O’Reilly won €25 each. As well as our group of ticket sellers tickets can be purchased from Convenience Store Ballinroad, The Village Inn, Village Flowers, Spar, Mike Kiely’s Butchers and Mousies Takeaway. Last Saturday evening we played Lismore in round 4 of the County Championship in Fraher Field where we recorded our second win of the Championship. This Saturday night we play Roanmore in Kill at 7 pm where a win would qualify us for the quarter final of the championship. SUBS: M. FIVES, C. KINDREGAN, C. PRUNTY. On Sunday morning last we played Ballinameela in Fraher Field in the Western Championship and after a very entertaining hours hurling it was our opponents who took the spoils. This Friday night we play Kilgobnet in our last game of the group stages in Colligan at 7:15 pm. This Sunday our Club Bingo returns to the CBS Hall at 8:30 pm where the jackpot is €1,200. Any member who wishes to put their name in the draw for All Ireland Hurling Final tickets is asked to contact the Club Secretary as soon as possible. Last Monday we played Clonea in Abbeyside. We played well in this contest and were always holding the advantage to record 6-22 to 1-4 win. Our last game was Monday away to Ballygunner on the 18th. Results next week. Panel: Jake O’Riordan, Eoin Ahearne, Daniel Raher, Sean Kent, Meldan O’Dwyer, Eoin Flynn, Shane Kiely, Dathi Brunnock, Jamie Walsh, Ben Flynn, Senan Travers, Cian O’Riordan, Michael Kiely, Patrick Fitzgerald, Oisin Hallahan, Danny Reynolds, James Riordan. Our under 13’s played Lismore in the Western Hurling Final last Saturday in Fraher Field. Our lads played well throughout the game with some great blocking and striking. The final score was 4-14 to 4-2. Next game here is the County Final on 6th September against the Eastern Champions. Panel: Jamie Moylan, Sean Roche, Danial Raher, Michael Troy, Colin Foley, Eoin Ahearne, Darragh Slevin, Cian O’Riordan, Senan Travers, Oisin Hallahan, Michael Kiely, DJ Kiely, David Hayes, Niall Buckely, Daniel Treen, Alec Norris, Rory Ahearne, Ben O’Donovan, Tadhg Collins. Our minor hurlers beat Clann na Gael in their third round championship fixture on Tuesday night last. Their next match is tonight (Wednesday) against Roanmore in the Kieran Lennon trophy match. Our under 16 hurling team were defeated on Thursday night last against Lismore in an evenly contested game. All in the club would wish Meldon O Dwyer a speedy recovery after picking up a serious head injury in the game. Our outdoor hurling training for juveniles begins again this Saturday (23rd August) morning beginning at 10:30am for juveniles between under 5 and 10. Training returns after our summer break on Friday evening at 6.30 for U6, U8 & U10. New members are always welcome. Our under 16s play Modeligo on Wednesday evening at 7.30 in Modeligo. All support would be greatly appreciated. Congratulations to Niamh Briggs on a fantastic Rugby World Cup campaign, what a role model she is for all our young girls. Click here to view pictures of Abbeyside's County Senior Hurling Championship victory over Lismore played at Fraher Field on Saturday night. As always, many thanks to Seán Byrne Photography for providing us with these great action shots.